Oh man I found some tapes in the basement tonight. I havent listened to this one since the mid 90's… Its so great, it really had me excited relisening to it again after all these years. This demo is when the band was just a three piece (guitarist and drummer did the grunts, and growls). B.T. along with Terrorizer and Napalm Death are what got me motivated to play in Monster X and write grind riffs in the early 90's. Obviously nothing we did could ever compare to any of these legends, but they def are the reason we did what we did. 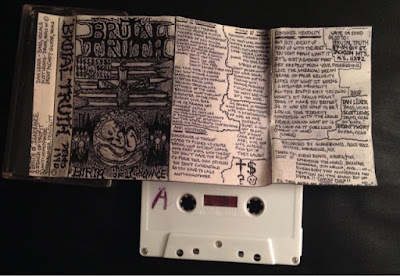 I bought this demo at Erl records in Albany shortly after it came out. Dave and Jack went on and on about how cool these guys were, and how I needed this demo. I bought it and was floored by the four songs. A few years later I ended up meeting members of the band at Erl as Jack and Dave set up a show for them at Bogies. One of the band members got busted prior to the show shoplifting breakfast sausages at the price chopper in Albany. A fond memory I have of seeing them live is when they played Saratoga Winners with some Capital District mosh metal band called Cutthroat. Cuthhroat played… like 150 kids were going nuts to them. They get done, and everyone leaves the gig except for me, and like three other friends. We went to the very front of this huge stage (came up to my chin), and Brutal Truth played to us like they were playing to a million folks. It was life changing, and impacted me tremendously. Total heroes. 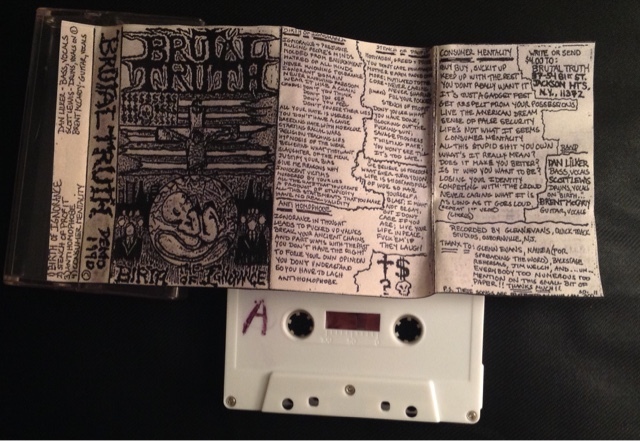 There are only four songs on this tape but they are crucial for grind/crust fiends.